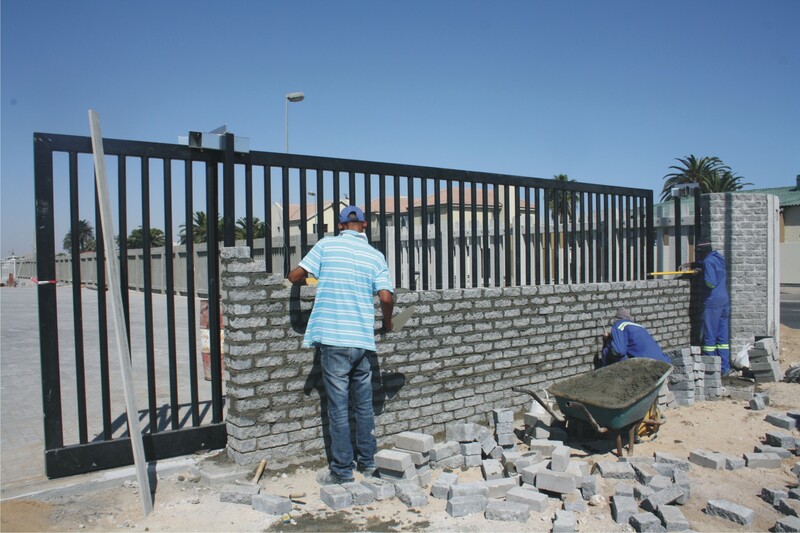 Walvis Bay « What Happened to the Portcullis? NamPort has recently commenced a massive N$3 billion construction project to build a new container terminal, but plans even more extravagant expansion in the years to come, according to its executive for marketing and strategic business development, Christian Faure. He expanded on the planned multi-billion dollar Southern Africa Development Community (SADC) Gateway Terminal envisioned for the area between Swakopmund and Walvis Bay this week. “The SADC Gateway terminal is still in the concept phases,” stressed Faure. “This development was considered the long term plan for the Port of Walvis Bay’s expansion, but plans have been brought forward mainly due to the construction of the new fuel tanker berth facility and the Trans-Kalahari railway line initiative for the export of coal from Botswana. This development is not to be confused with the new container terminal currently under construction at the port,” he said. Already NamPort has completed pre-feasibility studies and is currently busy with geo-technical evaluations to determine the structure of the ground in the area to be dug out, he said. NamPort is also positively engaging the Municipality of Walvis Bay on the land itself, and other role players that may be impacted, he said. “This is a massive development and to put it into perspective, the current port is 105 hectares in size. 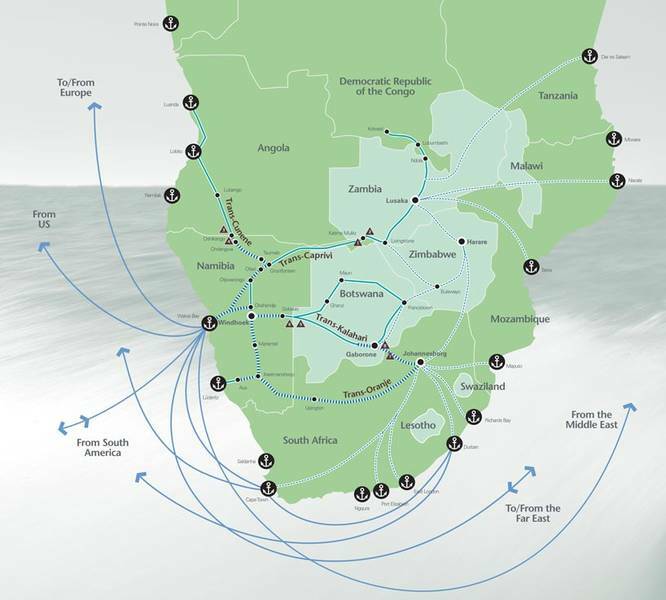 The SADC Gateway port is 10 times that with a size of 1 330 hectares. The new container terminal will add 40 hectares,” said Faure. 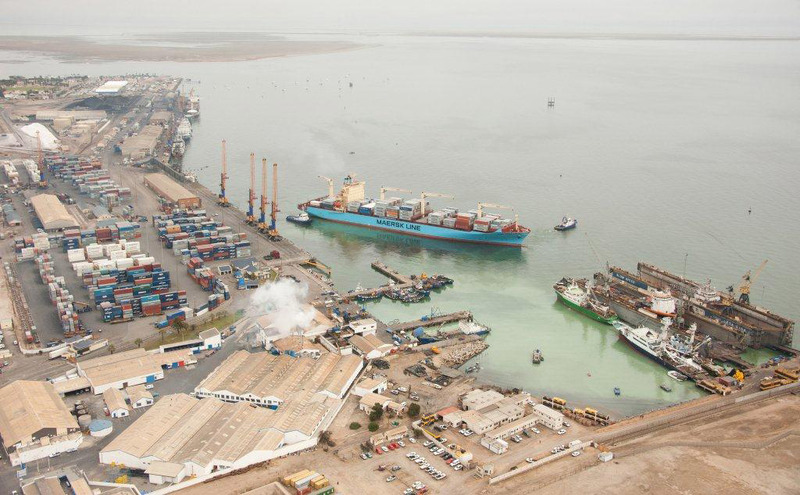 With Namibia’s reach to more than 300 million potential consumers in the SADC region, the port of Walvis Bay is ideally positioned as the preferred route to emerging markets in Botswana, Zambia, Zimbabwe, Angola, Malawi and the Democratic Republic of Congo. Faure explained that several mega projects have surfaced in the last few years that will not be feasible without the SADC Gateway terminal, including the Trans-Kalahari Railway Line, Botswana coal exports through Namibia, mega logistics parks planned in NDP4, the budding crude oil industry, large scale local mining product exports, as well as magnetite, iron ore and coal exports from Namibia. 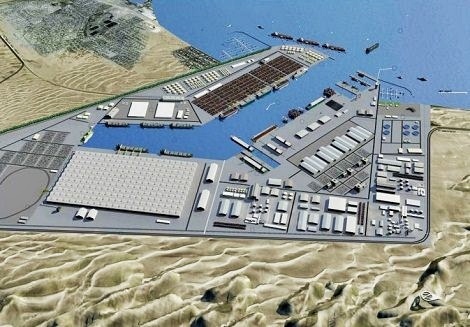 The SADC Gateway Port project (also sometimes called the North Port) will extend the existing harbour to the north of Walvis Bay between Bird Island and Kuisebmond. It will cover a total for 1330 hectares of port land with 10 000 meters of quay walls and jetties providing at least 30 large berths. The new port will also feature world class ship and rig repair yards, and oil and gas supply base, more than 100 million tons worth of under cover dry bulk terminal, a car import terminal and a passenger terminal, he explained. 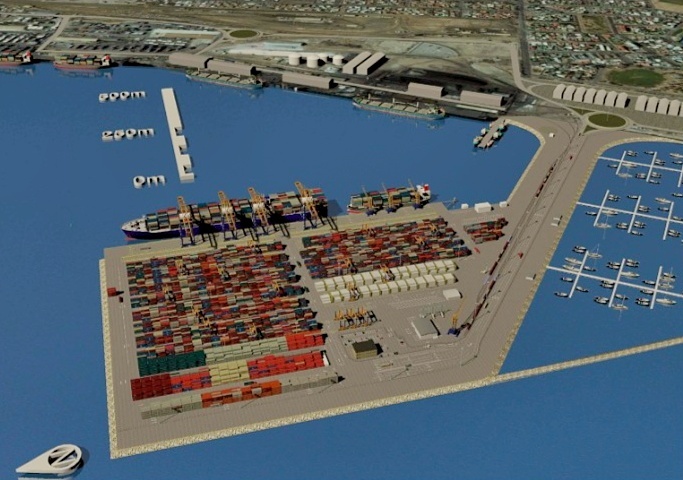 The African Development Bank Group (AfDB) and Namibia on Friday, November 8, 2013 signed a ZAR 2.9 billion (US $338 million) sovereign guaranteed loan to the Nambian Ports Authority (Namport) to finance the construction of the new container terminal at Port of Walvis Bay and a UA 1.0 million grant (US $1.5 million) to the Government of Namibia for logistics and capacity building complementing the port project loan. The project was approved by the AfDB Group in July 2013. The project is expected to enable Namport to triple the container-handling capacity at the Port of Walvis Bay from 350,000 TEUs to 1,050,000 TEUs per annum. It will also finance the purchase of up-to-date port equipment and the training of pilots and operators for the new terminal. The grant component will fund the preparation of the National Logistics Master Plan study, technical support and capacity-building for the Walvis Bay Corridor Group and training of freight forwarders. The project will stimulate the development and upgrade of multimodal transport corridors linking the port to the hinterland while improving the country’s transport and logistics chains. It will also boost competition among the ports and transport corridors in the region with the ripple effect on reductions in transportation costs and increased economic growth. The continued weakening of the Rand and an increase in the volume of imports has seen Namibia’s trade deficit widen to N$17 billion, the Namibia Statistics Agency (NSA) has said. The country’s import bill jumped 24% in 2012 to N$59 billion widening the trade deficit to N$17 billion compared to N$11 billion in 2011. Despite a fall in the share of some of the major imports to the total import bill, the value of imports still increased to N$59 billion compared to N$48 billion in the previous year. Major imports for 2012 included mineral fuels, mineral oils, vehicles, boilers and machinery. Fuel dominated the list of imports with a share of 13% up from 9% in the previous year. Vehicles were in second place with a share of 11% (compared to 12% in 2011) of total imports. Boilers, machinery and mechanical appliances occupied third place with 9% a slight decline from 10% in 2011. The Statistics Agency said an 80% increase in the value of oil imports (at N$7.8 billion) can be explained by a 14% depreciation of the Namibia Dollar/Rand against the US$ in the period under review since the 2012 average price of oil in US dollars was almost the same as in 2011. In addition, an increase in the volume of imports especially ships, boats and floating structures that recorded the strongest increase of almost 2100%, also contributed to the widening deficits. South Africa remains Namibia’s most important trading partner with combined trade between the two countries amounting to N$48.6 billion in 2012. However, the direction of trade between the two countries remain skewed with Namibia importing N$41.6 billion worth of goods from South Africa, while exporting goods worth only N$7 billion to South Africa. 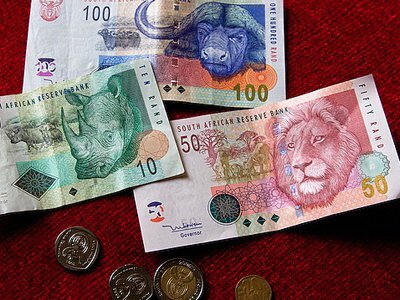 Analysts say while a weaker local currency boosts earnings of companies that sell their goods overseas, it adds to import costs, making food and fuel more expensive. With a relatively low industrial base, and a saturation in the mining sector, Namibia’s exports only grew marginally to N$42 billion up from N$37 billion in 2011. This growth is too small to have a meaningful impact on the widening trade deficit. A new regional trade route reaching from the Katanga Province in the Congo all the way to Walvis Bay as point of entry, is on the radar of the Walvis Bay Corridor Group following an agreement between Namibia and the DRC. Development of this major link started its first tentative steps recently when the Corridor Group opened an office in Lubumbashi, on the border of the DRC and Zambia.The Corridor Group said earlier this week it had launched an office in Lubumbashi, DRC, to create a strong business presence in the mineral-rich Katanga Province. The Walvis Bay Corridor Group Lubumbashi office was officially opened by the Governor of the Katanga Province, Hon. Moïse Katumbi Chapwe, supported by the Namibian Ambassador, Mr Ringo Abed, Corridor Chairman Mr Bisey Uirab, and Corridor Group CEO, Mr Johny Smith. The need for landlocked countries to gain access through an alternative trade route to and from sea was recognised, where neigbouring countries and beyond could benefit from access to the Port of Walvis Bay that offers importers and exporters reduced time and cost savings, high reliability, and cargo security. 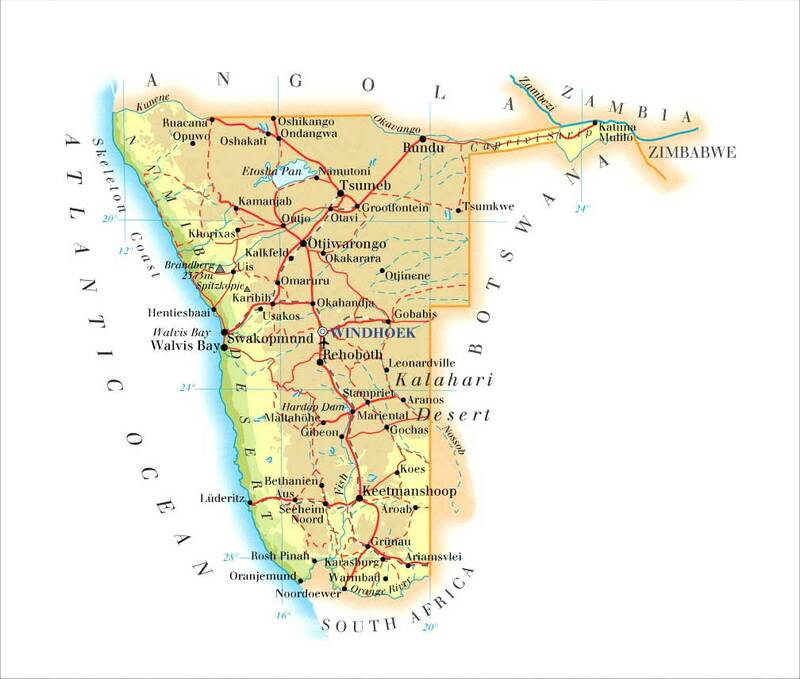 The Katanga Province offers a market of more than 2 million consumers and with the fast expanding mineral rich DRC there is also a need from the DRC Government for the Walvis Bay-Ndola-Lubumbashi Corridor to extend further towards other Provinces in the DRC. Walvis Bay is surely growing as an alternative trade route for Southern DRC in that various commodities are being moved via the Port of Walvis Bay such as copper, frozen products, machinery & equipment and consumables. Volumes along all the Walvis Bay Corridors have hit a record high of more than 63,000 tonnes for the month of January 2012, reports Namib Times. The report describes this as a significant growth of cargo volumes along the TransKalahari, TransCaprivi and TransCunene Corridors respectively. From a mere ten trucks a day that left the Port of Walvis Bay seven years ago to other SADC countries, more than 1,000 vehicles are now entering or leaving the Port of Walvis Bay on a monthly basis.